The Florida flats and backcountry of the Gulf Coast offer outstanding charter fishing opportunities for tarpon, snook, redfish, trout, cobia, and many other large, hard fighting gamefish. The many bays, grass flats, rivers, marshes, and barrier islands make this area a fishing paradise. 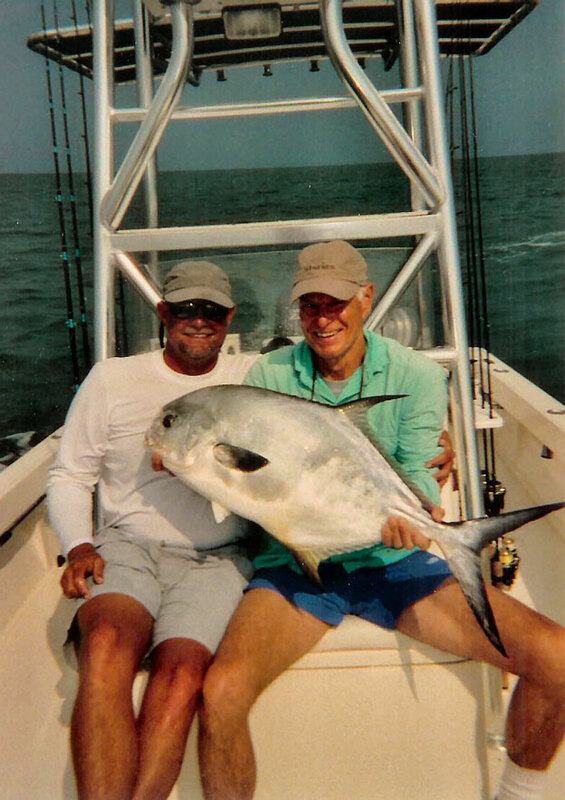 The conservation and environmental efforts of the citizens of Florida have brought back the “Good Old Days” of sports fishing on the West Coast of Florida. For information on our local species Click on the fish of you choice for more information and pictures. Tarpon-Megalops atlanticus "The Silver King"
The Tarpon has earned the name “Silver King” because it has it all. Tarpon are big, beautiful, tough, and acrobatic. 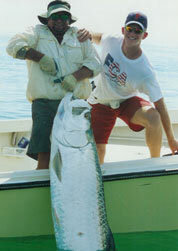 Ever since I caught my first tarpon as a young boy I have been hooked on this awesome gamefish. 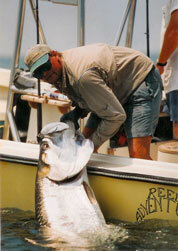 Tarpon are a tropical species and prefer water temperatures in the mid 70s and above. Tarpon are slow growers and mature sexually between 7 and 13 years. Tarpon spawn offshore between May and September. Because of the tarpons unique characteristics they have been able to survive since ancient times, Tarpon can tolerate a wide range of salinity and because tarpon can breathe air at the surface they can live in water with very low oxygen content. Juvenile tarpon are commonly found in fresh water. I look forward to the tarpon's annual migration into our area. The largest tarpon migration in the world occurs at Boca Grande between April and July as thousands of giant tarpon pour into the pass to feast on the shrimp, crabs, and bait fish flushing out of Charlotte Harbor. Some tarpon are present along the west coast of Florida all year, but since they prefer warm water tarpon seek the shelter of warm water areas in the winter. 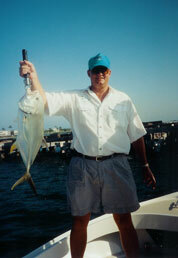 I fish for small tarpon (10-20#) in these warm water areas in late January, February, and March. Larger tarpon start to show up in our area in the middle of March and early April depending on the water temperature. By May the tarpon season is in full swing as thousands of tarpon pour into Boca Grande Pass and Charlotte Harbor. This is truly one of the natural wonders of the world and has to be seen to be believed. The tarpon I catch on tarpon charters at Boca Grande typically run between 80#-150# and they have been getting larger every year. Last year I caught many giant tarpon over 150 pounds and several huge tarpon that weighed over 200 pounds. 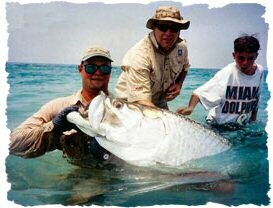 The tarpon pictured below weighed 210#. It was too large to lift out of the water without injuring it or me, so we got in the water for the photo. Incidentally, this was my customer's first tarpon!!! The tarpon move offshore to spawn around the full moons of June and July. When they return the tarpon move along the beaches and into the harbors. Fishing remains excellent until the first cold front in the fall pushes them south. 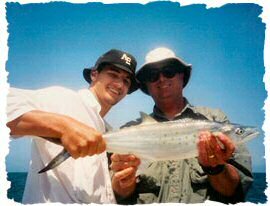 Because of the popularity of tarpon fishing at Boca Grande please book early so we can accommodate your dates. 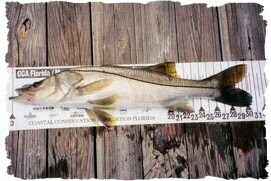 The common snook is Florida's inshore battler. 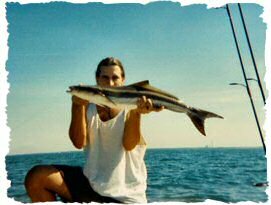 From the mangrove back country, to the flats, to the passes and the beaches this inshore brawler is a rock'em, sock'em, running, jumping handful of fishing excitement. 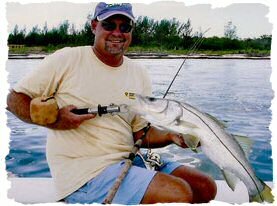 Most fish run between 4 and 8#s, but it is not uncommon to catch much larger snook as you can see from the pictures on this website. Because snook are a subtropical species, New Port Richey is about the northern end of the snooks range on the west coast of Florida though they have been showing up in greater numbers as far north as Crystal River as the Gulf water temperatures have been rising. Snook are very temperature sensitive, with 70 degrees being about the low end of their comfort zone. Water temperatures below 60 degrees can kill snook. Snook can tolerate fresh or salt water. As the water temperatures rise in the spring snook move out of their warm water haunts and out onto the flats, passes, and beaches. They spawn along the beaches and passes starting on the full moon in May and continue through the summer. 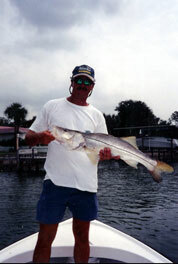 The cold water of winter really slows the snook fishing on our part of the coast from November to February. 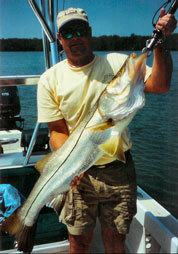 Snook charters this time of year is in the warmer water haunts as the fish move into these areas for their survival. By the time the water starts to warm in February the snook are really hungry and start moving out in search of food. As the water warms and the bait schools return the snook fishing starts to heat up and continues to get better all spring. Early season snook fishing around creek and river mouths with excellent fishing around the mangroves and on he flats as the water warms. By the full moon of May the snook have moved to the passes and beaches to spawn and the fishing can be outstanding! The fishing remains excellent all summer and early fall as these post spawn snook really turn on the feed bag. Snook fishing remains good until the falling water temperatures push them back into their warmer water sanctuaries. Our Redfish fishery is a great success story. 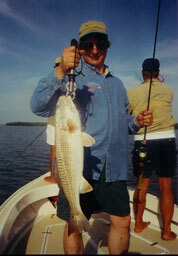 Through the efforts of the Coastal Conservation Association, redfish became a gamefish in the state of Florida in 1988. 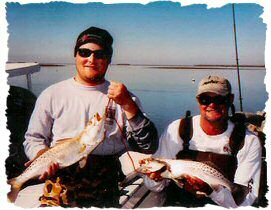 The removal of redfish from commercial harvest and strict slot limits have returned our redfish fishery to the glory days of old. Redfish grow to sexual maturity(about 28” and 8#s) in the inland bays and marshes the first 4 years of their life. 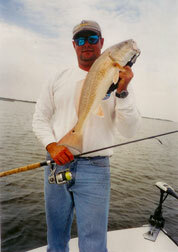 When redfish reach about 30” they move offshore to join the spawning population. Redfish spawn from August to November in the near shore waters. The redfish is a hardy, cold tolerant, and long lived fish(about 20 years or more). 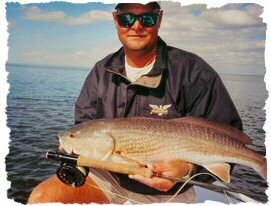 While redfish do not jump when hooked, they give an excellent account of themselves with repeated strong bulldog runs. The redfish's shallow water haunts make them exceptional site fishing targets for bait, jigs, plugs, and flies. I fish for reds year round. The prime season would be from March through October. But I have exceptional days right through the winter months. The heat of July and August slow things down a bit for redfish, but thats OK because snook season is in full swing. Many people mistake a cobia for a shark the first time the see one slowly cruising the flats. Their brown body, blunt nose, and flared pectoral fins do look very shark-like. Adult cobia prefer the shallower parts of the gulf and frequent bays, flats and inlets. Cobia often hang around buoys, channel markers, and wrecks or cruise the flats on the backs of large rays. Cobia grow very large with fish in the 30# range common and fish from 50 to60#s caught each season. A legal cobia must measure 33” from the tip of its nose to the fork of its tail. As our water warms to the high 60s and the bait fish start to return, cobia will soon show up on the flats. Site fishing for this big brown bruiser is a blast. My tower boat is a great asset when hunting for cobia. 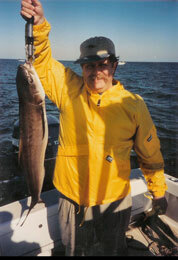 Once spotted , cobia will eat just about any well presented bait from live bait to jigs to fly. Because of their size and their determined fighting ability I keep a medium heavy action rod rigged and ready when I am on the flats during cobia season. The best months for cobia are March through July. 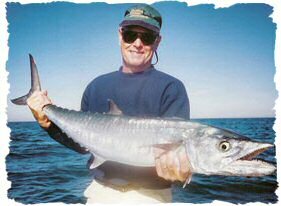 King mackeral, or kingfish as they are known in our area migrate through the west central Florida coastal waters twice a year. In the spring (usually around tax time) as the gulf water warms to the high 60s and the bait fish return, the kingfish will be right behind them. As the water continues to warm the kingfish continue their migration to their summer waters in the northern gulf. 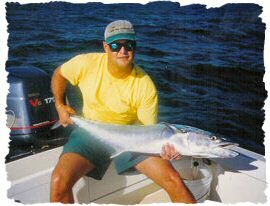 The kingfish migrate south in the fall around the middle of October as the waters cool and the follow the bait fish south. The kingfish cruise the near shore waters from a few hundred feet off the beach to several miles offshore. Fish in the 20# class are common and many big “Smoker Kings” over 40#s are taken each season. 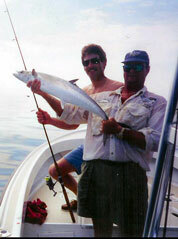 If you have never seen a skyrocketing kingfish you have missed a thrill of a lifetime. The kingfish is built for speed and often explode out of the water like a Polaris missile going straight up above your head with your bait in their mouth. The best months for kingfish are late March, April, and May and October, November, and early December. Spanish Mackerel invade the deep grass beds, beaches and wrecks as the water temperature approaches 70 degrees and the bait fish return. 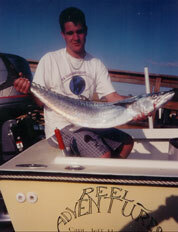 Spanish Mackerel are often caught on the flats by trout fishermen. Their toothy mouth will quickly part you from your jig. Typical fish run from 2 to 6#s. They are fast, aggressive feeders and are often found by watching for birds diving on busted schools of bait. 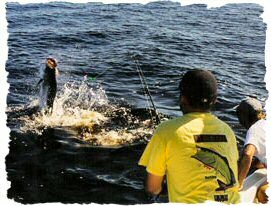 Once located the action can be non-stop with several anglers hooked up simultaneously. This can be really exciting fishing for everyone in the family. The kids just love the fast action and pull of these speedsters. The prime months for Spanish mackerel would be from March through May and October through November, although in recent years we have had Spanish mackerel in our waters right through the summer. This gamester get no respect until the first time you hook into one. 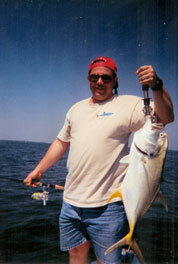 Pound for pound crevalle jacks are the hardest fighting fish to invade our inshore waters. Crevalle jacks prowl our flat in large schools, moving fast, and frothing the surface as they attack schools of bait fish. Crevalle jacks will readily hit a jig, plug, or fly. It is especially exciting to cast a top water plug or popper and see if you can get it back to the boat without being attacked. These fish bring it all and you will often have a half dozen fighting to get to your lure. The fish run 3 to 5#s and I very frequently run into schools of 8 to10# fish. The fish move offshore to spawn from March to September. Normally these fish are what I call a fish of oppurtunity. They are fast and when they move through the area you are fishing they are well worth pursuing. They do not require any special rigging so you can react quickly to their appearance. There are some predictable holding waters for these fish from January through March when you can target them specifically. This can be great fly rod and top water action. 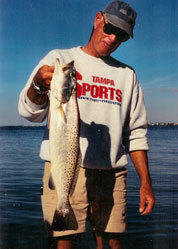 Spotted Seatrout-Cynoscion nebulosus "Speckled Trout"
Seatrout are the most plentiful gamefish in our local waters. Their numbers and sizes have greatly increased since the ban on inshore netting was approved in 1994. Eighteen to twenty inch trout are now quite common and “Gator Trout”( fish in the 25 to27 inch range) are increasing in numbers each year. Seatrout live on the grass flats in estuaries and move only short distances. They prefer water between 58 and 81 degrees. 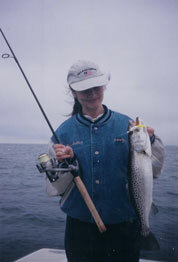 Seatrout are available all year with the prime months being January through April and October through December. May and June can be good but fishing tapers off as the water warms up in July, August, and September. Seatrout are just plain fun to catch. They readily hit baits, jigs, plugs, and flies. When you find the fish the action is steady with several rods all bent at once. This is great fishing for anyone but specially for kids. When my dad and I want to unwind we go trout fishing. There is something about the relaxed atmosphere of catching seatrout. Goliath grouper are the largest grouper in the west Atlantic. Goliath grouper can grow to 800+#s and were almost extinct in the late 1980s due to over fishing. The Goliath grouper is very territorial and has few enemies do to its size. 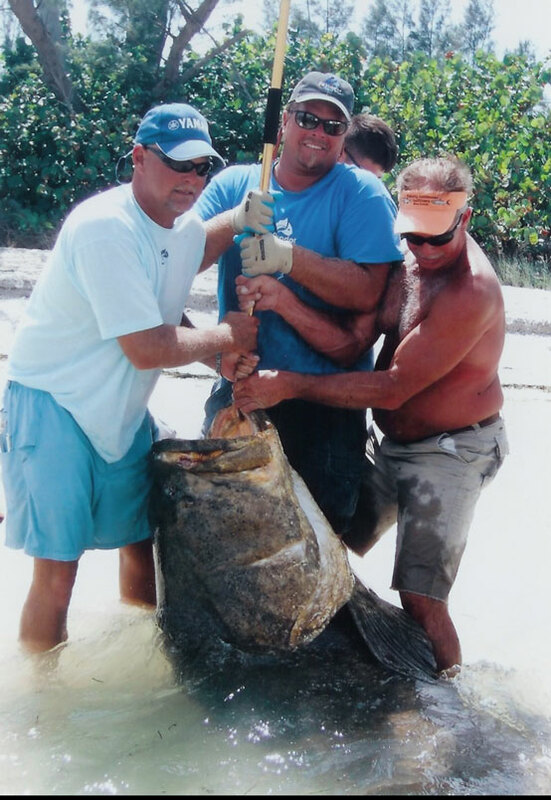 In 1990 the harvesting of Goliath grouper was prohibited and the population has rebounded in the keys and southwest Florida. Goliath grouper live in the inshore water, around docks, and in deep holes and ledges for the first 6 to7 years of their life. A juvenile Goliath grouper (from 1 to 50#s) is not sexually mature. Goliath grouper have a life span of 30 to 50 years and grow to enormous size. 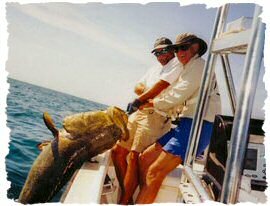 While Goliath grouper are protected from harvest in Florida waters they are really quite plentiful and will bring even the strongest man to his knees. Try to imagine lifting a Volkswagen with a fishing rod while it is fighting to stay in its home. 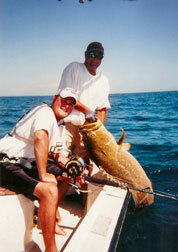 I fish for these giant Goliath grouper from May through July with all fish released at boat side. Think you have to go to the Keys to find Permit? Think Again. Not a lot is known about the life cycle of the permit, but it is believed that they move offshore to spawn from about April to July. These fish travel in schools and congregate on offshore structure. The typical permit runs between 12 and 30#s. 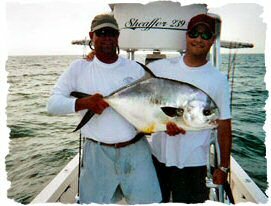 The permit's broad profile and hard fighting ability make them a handful on medium spinning tackle. Strong runs melt line off the reel after hook-up as the permit try every trick in the book to cut you off. 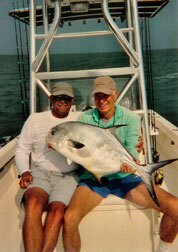 I fish for permit from late spring to mid summer. 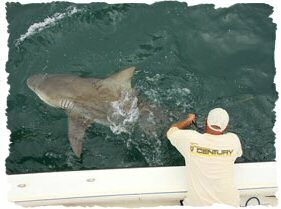 There is probably no more consistent shark fishing for large Hammerhead and Bull Sharks than at Boca Grande Florida during tarpon season. As the tarpon seek the abundant food source at Boca Grande Pass on there spring migration they are followed by their only predator, the giant hammerhead and bull sharks. There are so many sharks in Boca Grande Pass that it is hard to land an early season tarpon without having to contend with sharks. Early in the season the sharks may even out number the tarpon. The sharks are very large and aggressive. The tales of “Old Hitler”, a giant hammerhead, are not exaggerations. Hammerhead sharks in the 15 to 18 foot range are seen every year. I have caught bull sharks in excess of 500 pounds. 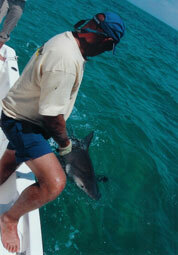 The sharks are so aggressive that I have had them attack tarpon that I am landing right at boat side. This is quite a spectacle to observe and sharks this size are very challenge to catch. 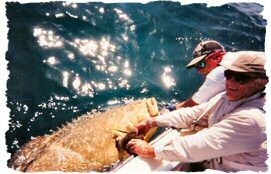 The prime shark season at Boca Grande is during the period from May through July when the tarpon are thick in the pass.